For small burns: Wash the leaves with soap and water. Boil 10 leaves in 5 glasses of water; cool. Soak the burn area for 10 minues, once a day. Fresh seeds when moistened produce a reddish colored juice that is applied to red rashes. Also used for wound healing, regulation of heavy menses, and thinning hair. The leaf, bruised with the head of a “walis-tingting” (broom made from frond ribs of the coconut leaves), mixed with warm coconut oil is applied on the forehead for headaches. Culinary: Seeds when soaked provide a red-tinged colorant use for cooking meats, imparts a subtle taste. This entry was posted in List of Medicinal Plants in the Philippines and tagged achuete on March 6, 2009 by Pinoy Herbs. 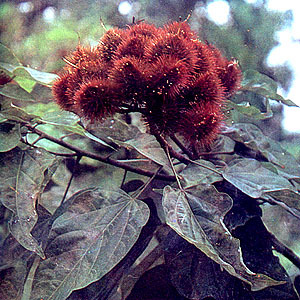 Hm, what i know about its scientific name is Bixa orellana family: Bixaceae….. Am I not right?